BDL Publications, Malta 2018, €15. Just when you think you know every nook and cranny of the 200-odd square miles that make up the Maltese islands and the stories they gave rise to, Fiona Vella and Oliver Gatt come out with a fascinating little book that shows just how many corners still remain unknown or wrapped in mystery. 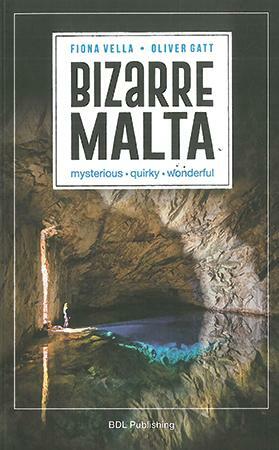 Bizarre Malta is indeed an unusual and intriguing contribution to Melitensia and readers will just love to discover arcane places and curious anecdotes. Many of the topics concern historical incidents while some buildings described are sadly no more or fast deteriorating, but there are enough locations to keep the inquisitive reader happy. One can safely say that, in the days to come, one is bound to encounter not a few adventurers, book in hand, seeking out these locations in town and countryside. A point that has to be made at the outset is that the book is complemented by a very large number of mostly excellent illustrations, many of them contemporary photographs taken by Gatt himself, but also a fine selection of old sketches and lithographs. Special mention must be made of the use of drones that give bird’s-eye-views of some quite otherwise inaccessible sites. One particular fine set of photographs shows Għar Ħarq Ħammiem, a huge cave with brackish water situated more or less under the doomed ITS buildings in St Julian’s. Enchantingly photographed, this is a site with a unique environment in our islands (the fine picture on the cover is just a tempting amuse-bouche). This is a site that needs further exploration, although one is sincerely afraid that it will fall victim to an ‘unavoidable’ accident when the ground over it is being excavated for the new hotel complex. It will then make a fine underground parking area, anyway! Another four natural oddities that are singled out – the Maqluba, the Dragunara Cave at L-Aħrax tal-Mellieħa, the Baħrija crater and the Bidni circle in Żabbar – are natural sinkhole depressions that have duly given rise to folk legends. The 55 accounts in the book include other geographic oddities such as the ‘face’ in the cliffs at Dwejra near the former Azure Window, the Marsascala underwater lines and Gozo’s knolls and hills. Spread around the island are several architecture follies that are still able to draw us by their oddness. Certainly the oddest is one that is sadly no more and which the authors have done a finejob in studying and investigating it and in the process, obtaining important information. Chateau Bertrand at Ta’ Qali was already known as ‘the mad house’ in its time. It was a house designed upside-down with eclectic and unorthodox architectural elements with windows, doors, and arches located at various levels and with stables in the first floor and the attic at ground level! Unfortunately, the chateau was damaged quite severely by enemy bombs in March and April 1942 although some say it was knocked down by the British as it afforded enemy planes an excellent site to pinpoint the airfield. The authors have managed to trace a good number of hitherto rarely seen illustrations of this legendary building. One of their most significant discoveries is that there is actually a similar building – Villino Florio – in Palermo, the work of Ernesto Basile, a pioneer of Art Nouveau in Italy. 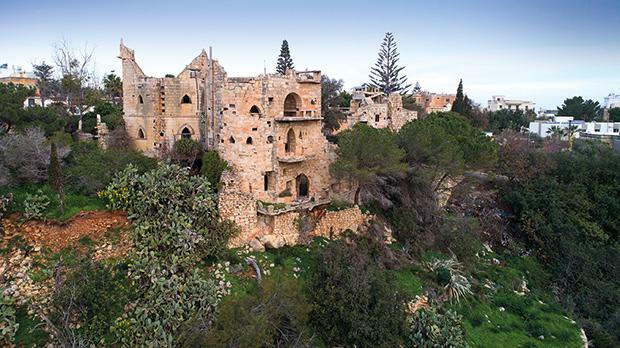 The story of Chateau Bertrand and the accompanying illustrations are indeed a most significant footnote to the story of architecture in Malta. Closer to our times is the Gaudiesque Villa Mystique in Madliena, the creation of that most genial and local eccentrics of the twentieth century: Marquis Joe Scicluna. He prided himself on not ever having any architectural training and he constructed his unique folly from the debris of bombed out houses and which weaves its sinuous way in the greenery over Wied Mejxu. It surely is a site that urgently deserves official protection for its very oddness before it is replaced by yet another tower in honour of the god of Lucre. The other ‘folly’ is Xlejli tower at Palazzo Dorell outside Gudja with its mysterious interior that reflects its technique of combining rough stones with various dark pieces of glass. The palazzo was for a time, the headquarters of Brigadier Graham in the very early days of the British period. Then there are odd objects from Malta’s past, like the chastity belt (most probably a fake one though but worth a good story) at Palazzo Falzon, the ruota for the depositing of unwanted babies at the former Santo Spirito hospital, the xatrambatra (a genuine example of which I think nobody has ever actually seen), the ‘shaman cache’ from the Brocktorff Circle – so unlike any other Neolithic remains that would have surely been passed off as fakes had they not been discovered in situ, the hook with a Lord Nelson connection in St John Street, Gozo’s pavements (they too have a story to tell), the three crosses at il-Bidni and so on, not forgetting of course the mystery to end all mysteries: the cart ruts that dot so many sites in the local landscape. The authors have also selected particular places that carry a mysterious aura about them as well as having their own stories to tell. They range from Strait Street to the Chapel of Bones and the Capuchin crypt in Floriana with its desiccated friars, the acoustic ‘ear’ at Magħtab, Popeye village, Filfla, the plague cemetery at Wied Għammieq, the old Valletta mandragg, as well as the notorious City Lights cinema in central Valletta which for years catered for ‘adult’ needs under the radar of the authorities. Even the controversial column outside Luqa, the one deemed too shocking for Pope Benedict’s gaze who thus,must have walked into the Sistine Chapel with his eyes fixed firmly on the floor, claims a place. Then there are some particular episodes culled from the pages of our history, such as the tragic trampling of over 100 children during Carnival days in 1823, the unfortunate executioner who died after having executed a fellow felon in Gallows’ Square in Rabat, the sole woman surreptiously buried in a grand master’s tomb at St John’s, the dgħajsa vs gondola race that took place in Venice and the French cannonball stuck in a wall in Żabbar, which should serve to whet appetites. Even Titti, the Jack Russell terrier which became a YouTube sensation by faithfully jumping after her master at Peter’s Pool, earns a mention and an excellent photograph. One highly arguable aspect in this charming book, which particularly irks me, is the decision to use Maltese versions of the names for the towns and villages instead of the accepted English versions, that is using Ħaż-Żabbar, Ħal Luqa, Ħal Għaxaq and so on instead of the accepted English version of Żabbar, Luqa, and Għaxaq respectively. This is tantamount to using Moskva for Moscow, Firenze for Florence or Kreta for Crete in an English text. This decision landed the authors, flying in the face of linguistic norms, in inconsistencies as they then had to opt for Rabat, Mellieħa and Naxxar rather than ir-Rabat, il-Mellieħa, and in-Naxxar respectively, for example. Surely they too must have felt unwieldy and inelegant to refer, say, to ‘a place near in in-Naxxar’. The next crazy step would then be to insist on writing Għawdex for Gozo. If this decision was the result of instructions from some local authority, it should be radically rethought. A local authority just cannot give instructions about the accepted norms of writing in a foreign language. Still these are just academic points. Bizarre Malta remains a fascinating book that is bound to be extremely popular. It will make a very exciting summer read with its short single-bite topics that can be read one after the other or browsed through. And surely, one hopes, there exist other local places and incidents that can justify inclusion in another volume.